Wisconsin is a state of the north-central United States. It was admitted as the 30th state in 1848. First settled by the French, the region was ceded to Great Britain in 1763 and became part of the Northwest Territory in 1787. Madison is the capital and Milwaukee is the largest city. Population: 5,530,000. The Great Lakes offered an easy access from Canada to the region that is now Wisconsin, and the Frenchman Jean Nicolet arrived at the site of Green Bay in 1634 in search of fur pelts and the Northwest Passage. He was followed by other traders and missionaries, among them Radisson and Groseilliers; Marquette and Joliet, who discovered the upper Mississippi; and Aco and Hennepin, from the party of La Salle. Meanwhile the spread of settlers in the East was bringing the Ottawa, the Huron, and other Native American tribes into Wisconsin, where they in turn displaced the older inhabitants, the Winnebago, the Kickapoo, and others. Similarly, the Ojibwa drove their kinsmen the Sioux westward from Wisconsin. Only the Menominee remained relatively settled. Nicolas Perrot helped (1667) establish Green Bay as the center of the Wisconsin fur trade, and in 1686 he formally claimed all the region for France. The fur trade flourished despite the 50-year war between the Fox and the French, and the historic Fox-Wisconsin portage was used by generations of traders from Green Bay and Prairie du Chien in their search for beaver and other furs. Like all of New France, Wisconsin fell to the British with the end of the French and Indian Wars (1763). British traders mingled with the French and eventually gained the bulk of the fur trade. The British hold continued even after the end of the American Revolution, when the Old Northwest formally passed (1783) to the United States and was made (1787) a part of the Northwest Territory. After Jay's Treaty (1794), northwestern strongholds were turned over to the Americans, but the British continued to dominate the fur trade from the Canadian border. In the War of 1812 Wisconsin again fell into British hands. It was only with the Treaty of Ghent (see Ghent, Treaty of) that effective U.S. territorial control began and that the American Fur Company gained control of much of the fur trade. Present-day Wisconsin was transferred from Illinois Territory to Michigan Territory in 1818. By then the fur trade was diminishing, but the lead mines in SW Wisconsin had long been active, and booming lead prices in the 1820s brought the first large rush of settlers. The region's great agricultural potential was also apparent, and after 1825 a considerable number of easterners began arriving via the new Erie Canal and the Great Lakes. They settled in the Milwaukee area and along the waterways. The U.S. army preserved order from key forts established at Green Bay (1816), Prairie du Chien (1816), and Portage (1828) and built bridges, trails, and roads throughout the region. The hostility of the Native Americans toward the incursions of aggressive settlers culminated in the Black Hawk War (1832). This revolt, brutally crushed, was the last Native American resistance of serious consequence in the area. In 1836, Wisconsin was made a territory, and the legislators chose a compromise site for the capital, midway between the Milwaukee and western centers of population; thus the city of Madison was founded. By 1840 population in the territory had risen above 130,000, but the people, fearing higher taxes and stronger government, rejected propositions for statehood four times. In addition, politicians were at first unwilling to yield Wisconsin claims to a strip of land around Chicago and to what is now the Upper Peninsula of Michigan. However, hopes that statehood would bring improved communications and prosperity became dominant; the claims were yielded, and Wisconsin achieved statehood in 1848. The state constitution provided protection for indebted farmers, limited the establishment of banks, and granted liberal suffrage. These measures and the state's rich soil attracted immigrants from Europe. The influx of Germans to Wisconsin was especially heavy, and some parts of the state assumed the tidy semi-German look that has persisted along with an astonishing survival of the German language. Liberal leaders, like Carl Schurz, came after the failure of the Revolution of 1848 in Germany and added to the intellectual development of the state. Contributions were also made, then and later, by Irish, Scandinavians, Germans who had previously emigrated to the Volga region of Russia, and Poles. The state's development was not always smooth. Although the state constitution provided for a system of free public schools, the principle was implemented only slowly. Similarly, the Univ. of Wisconsin (chartered 1848) was slow to assume importance. After a referendum (1852) ended the state constitutional ban on banking, farmers and many others mortgaged their property to buy railroad stocks, only to suffer distress when the state's railways went bankrupt in the Panic of 1857. Wisconsin was steadily antislavery; the Free-Soil party gained a large following in the state (although the party's homestead plank and economic program were the major attractions). Wisconsin abolitionists played an important part in the formation of the Republican party. In the Civil War Wisconsin quickly rallied to the Union. Copperheads were few, but many War Democrats opposed the abridgment of civil liberties and other aspects of the war effort, and some of the German immigrants, who had left Germany because they opposed compulsory military service, opposed even voluntary war service. The boom times brought by the war mitigated discontent, and economic and social growth was rapid during the 1860s and after. Railroads and other means of communication linked Wisconsin closely to the East. The meatpacking and brewing industries of Milwaukee began to assume importance in the 1860s. Wheat was briefly dominant especially in S Wisconsin, but was superseded in the 1870s as states further west became wheat producers and Wisconsin shifted to more diversified farming. Its great dairy industry developed, spurred by an influx of skilled dairy farmers from New York and Scandinavia and by the efforts of the Wisconsin Dairymen's Association (est. 1872). In these years the great pine forests of N Wisconsin began to be greatly exploited, and in the 1870s lumbering became the state's most important industry. Oshkosh and La Crosse flourished. With lumbering came large paper and wood products industries, and the opening of iron mines in Minnesota and Michigan promoted the N Great Lake ports and increased industrial opportunities. Although hard hit in the panics of 1873 and 1898, Wisconsin was generally prosperous in the late 19th cent., and the reform-minded Granger movement and Populist party received less support than in other Midwestern states. A trend toward liberal political views was stimulated in Wisconsin by socialist thought, which was introduced early. Socialism, in a pragmatic and reformist rather than a doctrinaire form, dominated Milwaukee politics for many years and gave the city efficient government, particularly under the leadership of Victor Berger and Daniel Hoan. Stemming from a different source was the reform spirit of specialized and advanced Wisconsin farmers, who recognized the need for a more viable political and economic framework. In the early 20th cent., reform sentiment blossomed in the Progressive movement, under the tutelage of the Republican leader, Robert M. La Follette. This pragmatic attempt to achieve good effective government for all and to limit the excessive power of the few resulted in a direct primary law (1903), in legislation to regulate railroads and industry, in pure food acts, in high civil service standards, and in efforts toward cooperative nonpartisan action to solve labor problems. An important adjunct of progressivism was the Wisconsin idea—that of linking the facilities and brainpower of the Univ. of Wisconsin to progressive experiments and legislation. The plan owed much to Charles McCarthy and to the support of university president Charles Van Hise, and it brought such diverse benefits as the spread of scientific agricultural methods and the many labor and other bills drafted by Professor John R. Commons. The progressive movement was temporarily halted by World War I. La Follette, some Socialists, and many German-Americans were critical of U.S. involvement in that war, but they were a distinct minority. Wisconsin was generally prosperous in the 1920s; industrialization made rapid strides, reforestation of the once great but now exhausted timberland was stimulated by state legislation, and the dairying industry continued to grow. Wisconsin was alone in voting for its native son, La Follette, when he ran for president on the Progressive party ticket in 1924, and in the state his policies continued to be carried forward by his sons Robert M. La Follette, Jr., and Philip La Follette. Wisconsin's pioneer old-age pension act (1925) and its unemployment compensation act (1931) served as models for national social security a few years later. The Great Depression of the 1930s struck particularly hard in industrialized Milwaukee, but some relief was provided by the New Deal, and in addition Gov. Philip La Follette attempted, in his little new deal, to improve agricultural marketing, promote electrification, and enforce fair labor practices. During World War II, Wisconsin's shipbuilding industry flourished, and in the prosperous postwar era, urbanization and industrial growth continued; even in the nationwide slump of the late 1980s, the state's manufacturing sector proved resilient. Wisconsin politics continued to resonate on the national scene. U.S. Sen. Joseph McCarthy aroused controversy with his unsubstantiated anti-Communist campaign of the 1950s, but McCarthyism was balanced by other political strains in the state; thus Milwaukee, in the same period, again elected a Socialist mayor, and the Democratic party, long no match for Republican or Progressive forces, has gained strength in state elections since the late 1950s. In the 1990s the state was a pioneer in welfare reform. Wisconsin visitors and residents enjoy the state's 7,446 streams and rivers. End-to-end they'd stretch 26,767 miles. That is more than enough to circle the globe at the equator. Wisconsin's Door County has five state parks and 250 miles of shoreline along Lake Michigan. These figures represent more than any other county in the country. In 1878-1879 the Wisconsin legislature approved the creation of a state park in Vilas County. The proposal was not successful and the state ended up selling two-thirds of area land to lumber interest for $8 an acre in 1897. In 1900 land acquisition for Wisconsin's first state park began. The park became Interstate State Park located in St. Croix Falls. Devil's Lake was established in 1911. The facility has become one of Wisconsin's oldest and most famous state parks. It leads the state parks in attendance. The House on the Rock was designed and built in the early 1940s. It is considered an architectural marvel and is perched on a 60-foot chimney of rock. The 14-room house is now a complex of rooms, streets, buildings, and gardens covering over 200 acres. The Infinity Room contains 3,264 windows. The state is nicknamed the Badger State. Wausau is the Ginseng Capital of the World. The American Birkebeiner, a 52K cross-country ski race between Cable and Hayward, is the largest on the North American continent. Wisconsin snowmobile trails total 15,210 miles of signed and groomed snow highways. 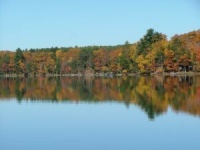 In the 1930s the Flambeau River State Forest was established and became a legacy of the Civilian Conservation Corps and the Works Project Administration. Noah's Ark in Wisconsin Dells is the nation's largest water-themed park. Belleville is the Unidentified Flying Object Capital of Wisconsin. Potosi is the Catfish Capital of the state. The nation's first kindergarten was established in Watertown in 1856. Its first students were local German-speaking youngsters. Wisconsin is the dairy capital of the United States. Wisconsin produces more milk than any other state. The National Fresh Water Fishing Hall of Fame in Hayward is shaped like a Muskie. The original Barbie is from Willows. Barbie's full name is Barbie Millicent Roberts. Bloomer is the Jump Rope Capital of the World. Milwaukee is home of Harley Davidson Motorcycles. Somerset is the Inner Tubing Capital of the World. Green Bay is Wisconsin's oldest city. Wisconsin's second oldest city is Prairie du Chien. The state's constitution is the oldest of any state west of the Allegheny Mountains. It was adopted in 1848. Boscobeel is the Turkey Capital of the state. The Republican Party was founded in Ripon in 1854. The Hamburger hall of fame is located in Seymour. Monroe is the Swiss Cheese Capital of the World. Mercer is the Loon Capital of the World. Famous Wisconsinites include: Harry Houdini, famous magician and escape artist. Douglas MacArthur, well known World War II and Korean War general. Frank Lloyd Wright, America's most famous architect. William H. Rehnquist, Chief Justice of the United States Supreme Court. Don Ameche, actor and winner of an academy award for his performance in "Cocoon." Mount Horeb's internationally known Mustard Museum holds the world's largest mustard collection. The museum contains more than 2,300 varieties of mustard. The museum celebrates National Mustard Day each August. The National Freshwater Fishing Hall of Fame is in Hayward. Eagle River is known as the Snowmobile Capital of the World. Marshfield is located in the geographic center of the state and is known Hub City. Bonduel is the Spelling Capital of Wisconsin. Muscoda is the Morel Mushroom Capital of Wisconsin. Sauk City is Wisconsin's oldest incorporated village. Prairie du Sac hosts the State Cow Chip Throwing Contest on Labor Day weekend. Sturgeon Bay is the Shipbuilding Capital of the Great Lakes. Sheboygan is the Bratwurst Capital of the World. The falls in Niagara has the same geological feature as Niagara Falls, New York. Green Bay is the Toilet Paper Capital of the World. This page was last modified on 17 January 2013, at 19:32. This page has been accessed 5,673 times.